It was just a couple of weeks ago when I tried spaghetti squash for the first time. I baked it in the oven and just served it plain. It was pretty boring. After eating a few bites, I grabbed a frying pan and sauteed it with some garlic. Guess what? It was delicious! 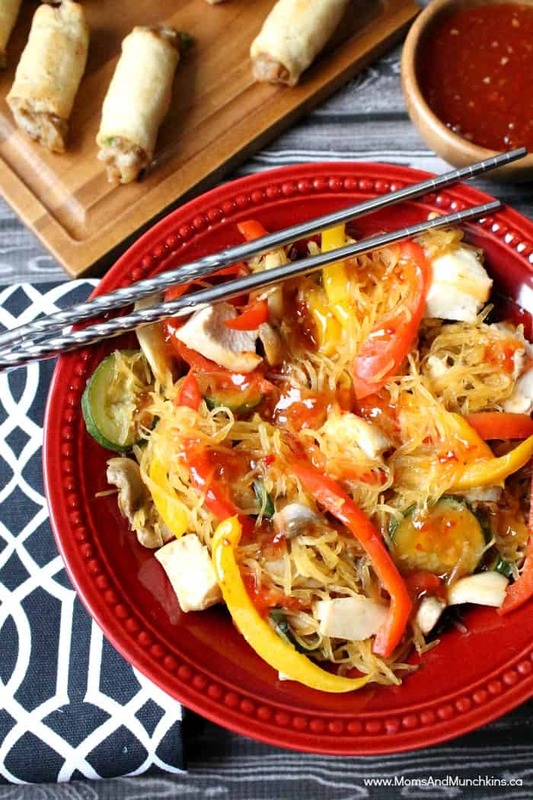 So delicious that I decided that I had to make a spaghetti squash stir fry the next time I served it for supper. We tried it tonight and I honestly didn’t miss the rice or noodles. This recipe received two thumbs up in my recipe book and I’ll be making it again for my family soon. This recipe is surprisingly easy to prepare but it does take some time so you’ll have to plan for it in advance. Slice the squash in half (lengthwise). Scoop out & discard the seeds. Place squash halves cut-side up in a shallow baking dish. Brush with 1 tablespoon olive oil. Roast for 45 minutes or until a fork punctures the squash easily. Remove squash from the oven and use two forks (one to hold the squash in place and one to scrape out the squash) to scrape the squash into stringy "noodles". In a large electric frying pan, fry one tablespoon of oil with zucchini and garlic. Once the zucchini has started to soften slightly, add the bell peppers, mushrooms, and spaghetti squash. Continue cooking until the vegetables are slightly softened (don't overcook). Transfer to a serving bowl, top with cooked chicken and set out sauce so guests can decide how much they'd like on their own serving. For more delicious recipe ideas, visit our Easy Party Food and Family Recipes page. Never miss a delicious update by following us on Facebook, Twitter, Pinterest, Google + and Bloglovin’.